LA JOLLA,CA—Dennis O’Leary of the Salk Institute was the first scientist to show that the basic functional architecture of the cortex, the largest part of the human brain, was genetically determined during development. But as it so often does in science, answering one question opened up many others. O’Leary wondered what if the layout of the cortex wasn’t fixed? What would happen if it were changed? 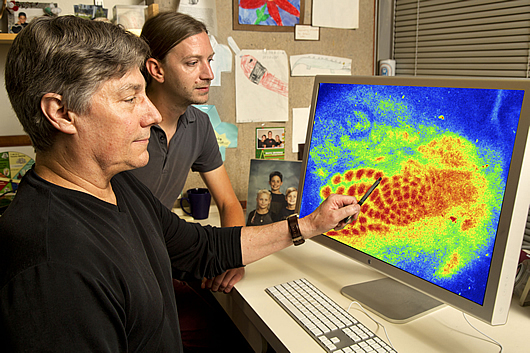 In the August issue of Nature Neuroscience, O’Leary, holder of the Vincent J. Coates Chair of Molecular Neurobiology at Salk, and Andreas Zembrzycki, a postdoctoral researcher in his lab, demonstrate that altering the cortical layout is possible, and that this alteration produces significant changes in parts of the brain that connect with the cortex and define its functional properties. These mechanisms may lay at the heart of neural developmental problems, such as autism spectrum disorders (ASD). Sense receptors distributed over the body surface are represented in corresponding sensory maps in somatosensory cortex (S1). Like in Penfield’s “Homunculus” illustration, their size in S1 is dictated by the number and density of sense receptors and nerves that connect each body part with S1, rather than the size of the body part. A normal “Mouseunculus” (WT) contains highly enlarged maps representing the face and whiskers. 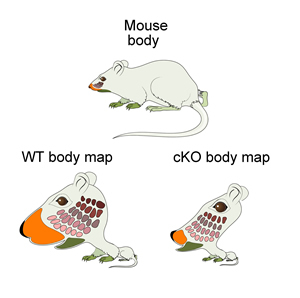 In animals lacking Pax6 in the neocortex (cKO), all body maps are very small and incomplete resulting in a highly distorted “Mouseunculus” that schematizes abnormal somatosensation in these mice. The human cortex is involved in higher functions such as sensory perception, spatial reasoning, conscious thought and language. All mammals have areas in the cortex that process the senses, but they have them in different proportions. Mice, the favorite laboratory animal, are nocturnal, so they have a large somatosensory area (S1) in the cortex, responsible for somatosensation, or feelings of the body that include touch, pain, temperature and proprioception. Even with relative sizes to other species set in place, areas in the cortex of humans may differ greatly across individuals. Such variations may underlie why some people appear to be naturally better at certain perceptual tasks, such as hitting a baseball or detecting the details of visual illusions. In patients with neurological disorders, there is an even wider range of differences. The neurons in S1 are arranged in functional groups called body maps according to the density of nerve endings in the skin; thus, there’s a larger group of neurons dedicated to the skin on the face, than the skin on the legs. Neurosurgeon Wilder Penfield famously illustrated this idea as a “sensory homunculus,” a cartoon of disproportionately sized body parts arching over the cortex. Mice have a similar “mouseunculus” in their cortex in which the body map of the facial whiskers is highly enlarged. These perceptual maps are not set for life. For example, if innervation of a body part is diminished early in life during a critical period, its map may shrink, while other parts of the body map may grow in compensation. This is a version of “bottom-up plasticity,” in which external experience affects body maps in the brain. “Top-down plasticity complements in a reverse fashion the well-known bottom-up plasticity induced by sensory deprivation,” says O’Leary. Normally, the body map in S1 cortex mirrors similar body maps in the thalamus, the main switching station for sensory information, which transmits somatosensation from the body periphery to the S1 cortex through outgoing neural “wires” known as axons. In the newly discovered top-down plasticity, when S1 was made smaller, the sensory thalamus that feeds into it is also subsequently reduced in size. Other researchers on the study were Shen-Ju Chou of the Salk Institute and Ruth Ashery-Padan and Anastassia Stoykova of the Max Planck Institute for Biophysical Chemistry, Goettingen, Germany. This work was supported by the National Institutes of Health and the Vincent J.Coates Chair of Molecular Neurobiology.